Smart and Simple Sylvia Sewing Furniture is the only furniture manufacturer that designs and manufactures modular furniture. This allows the perfect combination of cabinets and storage chests to be created for today's quilter and sewer. Begin with one piece of furniture and add drawer stacks for a variety of combinations. 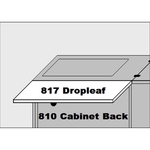 Some cabinets even have an optional Quilter's Extension for extra surface area. 13) Dowel construction for tight, strong joints. *All cabinets come in a Melamine finish Most with five color choices: White with Oak Trim (W); Grand Cherry (156), Teak (49), Mahogany (372), and Castle Oak (373) with contrasting maple interiors. (Mahogany is special order.) They are heat & scratch resistant for long-lasting beauty and durability. The sewing machine cabinets use Sylvia Design or Dream World inserts. The Sylvia Design inserts are available in clear, white or maple. Please specify sewing machine brand and model number when ordering the inserts. 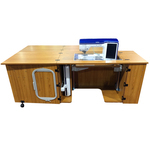 Durable, Distinctive, Smart and Simple Integrate your workspace with Sylvia Sewing Furniture. 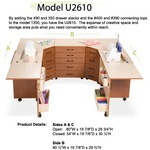 Sylvia Sewing Furniture is the only furniture manufacturer that designs and manufactures modular furniture. 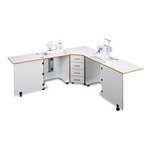 Our sewing furniture allows you to sit centered in front of the needle for accuracy and sewing comfort. 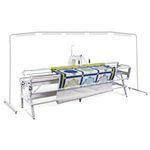 Let the 3-step patented Rudersburg Hydraulic Lift effortlessly raise or lower the sewing machine or serger for ease of use. Flush-mounted hinges will never snag your delicate fabrics or large quilts. Solid ConstructionOur glued and doweled construction provides strong, tight joints for years of trouble-free sewing and oversize steel-sided drawers protect your supplies. 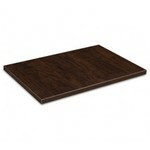 Our furniture has gently rounded edges and corners that are durable and smooth to the touch with a distinctive look. The extra thick top and base of our products give strength and stability, and cabinets fold away to protect the machine. 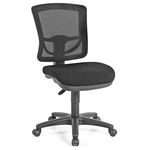 Easy to Use, Easy to Move each model has Commercial-grade locking casters (wheels) for easy movement and positioning. Sylvia sewing furniture comes with a Lifetime warranty, and is fully assembled with the exception of the wheels.